« Achievement Guide: Lovin’ Squirrels and Killin’ Snakes. We’re having a FIRE SALE!! In the switch of accounts, I ended up having to delete all of my alts, since I wouldn’t be transferring them. Not wanting to waste a copper, I made sure to empty out all their bags, sell everything sellable (even the bags themselves) and send everything of remote value to my communal bank alt. I had a lot of alts at various stages of the game. Ferguson still had his stockpile of Outlands herbs that I didn’t bother selling when they were hot on the market. Some of my alts had gathered mats they’d saved up. Can you identify all the crap? There’s at least 2 more mails of stuff in his mailbox as well. I’ve realized I’m going to need to save up a lot of money for Ferguson – if I’ve done my math correctly, dual-specs and fully mountifying (without faction discounts) is gonna knock me back 8645 gold. Holy crap. So, I decided to drop everything I can possible sell on the auction house. I put up 102 auctions on Tuesday night, and vendored a bunch of stuff I figured wouldn’t sell. So far the mod has proven useful. I’ve used Auctioneer before, but there was a bunch I didn’t understand and didn’t use. About halfway through posting my stuff, I got pretty lazy and just let AuctionLite do most of the pricing for me. And it seemed to work out okay. 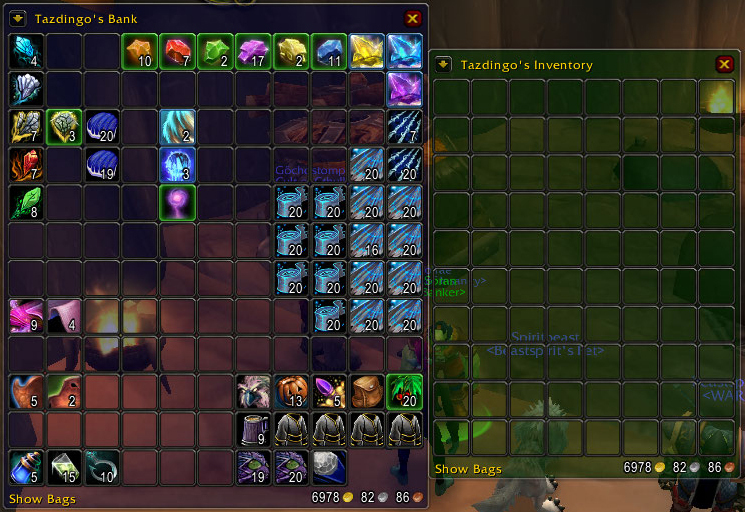 As of this morning, I’ve made 942 gold from the stuff I put up, and there’s still 33 auctions left that expire tonight. It’s certainly a start! Glad to hear AuctionLite is working out for you. It’s very, very fast, isn’t it? Yeah! It’s super fast. And it doesn’t have all the statistical info that I always ignored on Auctioneer. I’m not an economist – I just wanna sell a few things once in a while, I’m not into the whole watching the market and taking advantage of it. Too much work! I feel the same way about Auctioneer. Going to check out AuctionLite this evening when I get off work. 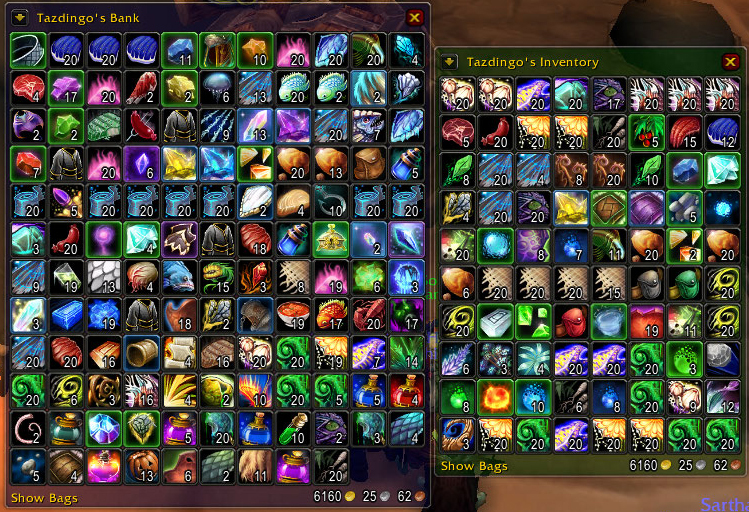 Also, what Bag Addon is that in the screenshots Brajana? Looks like Bagnon to me. Boostah’s got it. Bagnon is my bag addon of choice!